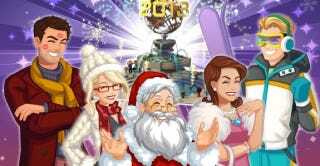 To help ring in the new year, players in SimCity Social can now complete three different Parts in a large "In with the New" event in their cities. Similar to the Cool Yule Christmas event, this In with the New saga is timed, with quests being split into three different Acts or Parts. We're here with a guide to completing all of the quests in Part 1, thanks to the game's official forums. Let's get started! The Outdoor Dance Party is the "free" business that EA / Playfish started offering to players early this week. It requires building materials to finish, so it's definitely not entirely free, but it will produce 1,000 Simoleons every four hours, making it pretty profitable in the long run. As for the Fireworks Factory, this large Factory can be purchased in the store for 35,500 Simoleons. If you already have one in your city, it can be collected from every two and a half hours. When you complete this first quest, you'll receive 2,000 Simoleons. The Honey Factory costs 57,000 Simoleons in the store, while the Candy Factory won't even unlock for purchase unless you've reached a population of at least 31,500 citizens in your town. It also has a high pollution rate, so be prepared for both of those factors when going into this quest. Finally, the Mocktail Bar is a business that requires 160 Fame points to purchase. Fame points are those golden ribbons that you earn when visiting friends, so if you're an incredibly dedicated "visitor," you should have more than enough Fame built up to purchase a Mocktail Bar (if you don't have one already). If you've already purchased one, it can be collected from once every two and a half hours. You'll receive three Holiday Snapshots for completing this quest. The Outdoor Dance Party can be upgraded by collecting four Foam Fingers, five Fury one Flair and four Animal Mascots. While you can ask your friends for many of these items, you can also purchase them outright with Diamonds if you don't feel like waiting for help. Even after you've collected these materials, you'll still need to pay energy and Materials before you can finally finish the upgrade. As a reminder, this business can be collected from once every four hours. You'll receive three Harmony for finishing this final quest in Part 1 of the In with the New event. Again, this is a limited edition quest series, so you'll only have a week to finish it off. Good luck! What do you think of this In with the New series of quests in SimCity Social? Do you think you'll be able to finish them all in the short time remaining? Let us know in the Games.com comments!